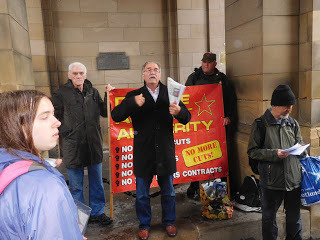 On Thursday morning, June 29th, with its continuous rain of biblical proportions, RIC-Edinburgh members joined with the Edinburgh Campaign Against Poverty, We Are All Daniel Blake, the Scottish Unemployed Workers Network and Dundee Against Austerity to support the delegation of young women addressing a session of City of Edinburgh Council. Messages of support were also sent form Castlemilk Against Austerity and film-maker, Paul Laverty. In 2012, one of RIC-Edinburgh’s first actions was to join the widely supported demonstration against the bedroom tax. This time, though, RIC’s participation followed the talk given the week before by Lynn McCabe, at the 90 strong RIC-Edinburgh Assembly on Tuesday June 20th. At this meeting, Lynn explained that the young women involved in the campaign to stop families being evicted because of the benefit cap were unable to attend the meeting tonight due to childcare difficulties. Lynn is a community worker in North Edinburgh and has been helping to support the campaign, however, she was speaking tonight in a personal capacity. The campaign has identified 11 families with 42 children facing eviction from privately rented homes in North Edinburgh due to the Benefits Cap. Some have already been evicted and have been forced to live in appalling B & B’s and hostels. The situation has been made worse due to the families being moved outwith their local community where they have support networks. They are also having to travel long distances to get children to and from school. When the families have been evicted from their homes, they must present as homeless and basically can only take what they can carry. Their belongings are collected on the day of their eviction and put into storage until they are allocated permanent accommodation (currently between 12 – 18 months). It costs £60 to access items from the storage containers. The women have never been involved in a campaign before but felt they had no choice as their backs were against the wall. They have been supported by local activists from North Edinburgh and across the city. Their immediate demand is for Edinburgh Council to pay full DHP to completely cover rent to prevent any more families from losing their homes. They are also demanding an end to families being allocated Bed and Breakfast accommodation and asking for families to be housed in flats which meet acceptable standards in suitable areas as close to their former homes as possible. In the longer term they want the council to build more social housing, which would help to address the current housing crisis. The campaign is also directed at the Scottish Government and Westminster. They want the Scottish Parliament to allocate sufficient funds to local authorities to cover DHP, as they were forced to do over the Bedroom Tax and they want Westminster to scrap the benefit cap. To date, the women have lobbied local politicians, occupied their local housing office, held a demonstration in the city chambers, protested outside Ruth Davidson’s constituency office and are planning a deputation at the Council Chambers on Thursday 29th June. They are looking for support from activists from across the city as they know that this issue is not confined to North Edinburgh.